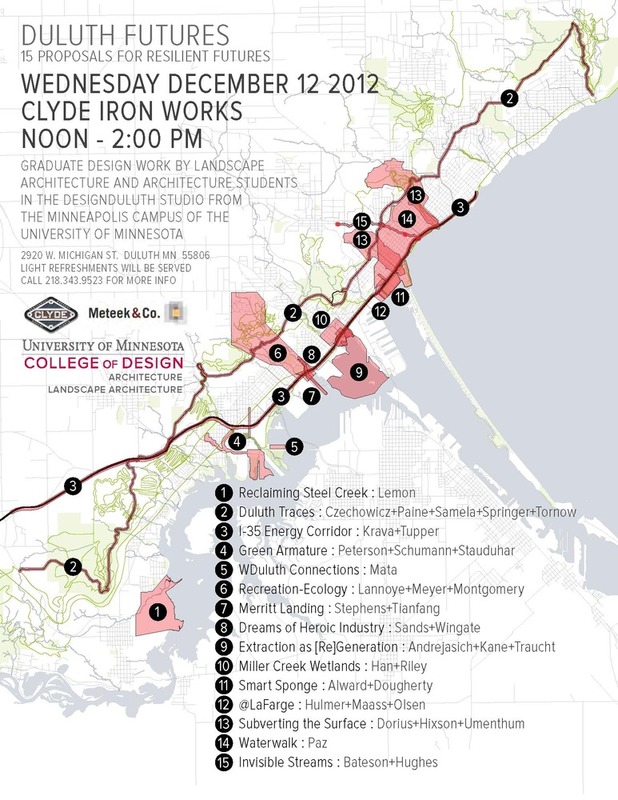 Next Wednesday December 12, Noon-2:00 pm at Clyde Iron Works, 36 graduate students will present their semester’s work on ideas for resilient futures for Duluth. The Landscape Architecture and Architecture Graduate students from the UMN Minneapolis campus began their semester with a visit to the Iron Range and Duluth in September. They worked in teams to analyze the complex systems of industry, infrastructure, culture and land use. Working with Mayor Ness’ “90 by 20” prosperity agenda, students then formed new teams to focus on opportunities they saw to create resilient ideas for Duluth’s future. They will present their projects next Wednesday at Clyde Iron Works. Drop in and see the possibilities they’ve invisioned–there will be models, maps, and renderings to see. Light appetizers will be served. Come on by!